At the 76 kilometre point of the Round-Baikal railroad. In this section, general information on the lake is presented with links to pages in The Magic of Baikal where you can find more detail. When gathering information, I found that it varies from one source to another, sometimes quite considerably. For example, there is still not one opinion as to the number of islands in Baikal, or the number of rivers flowing into the lake, and so on. The origin of the names of capes, islands, inlets and other sites are often a mystery. I have tried to take information from reliable sources, and indicate discrepancies with reasons for them. Lake Baikal is in the south of East Siberia. In the form of a new moon, Baikal stretches from south-west to north-east between latitudes 55°47' and 51°28' in the northern hemisphere and longitudes 103°43' and 109°58'. The lake is 636 km long, while its width varies from 81 km at its greatest point in central Baikal, to 27 km at its narrowest point, opposite the delta of the river Selenga. Baikal is 455 metres above sea level. Its shoreline measures some 2000 km, more than half of which is protected. The surface area of the lake, when its water level is 454 m above sea level, is 31470 square kilometres. The maximum depth of the lake is 1637 m and average depth - 730 m. Some sources state that the maximum depth is 1642 m. Which is correct? The answer to this question is somewhat paradoxical - they are both correct. The thing is that the telemetry error for such depths is about 2%, i.e. 30 metres. So really it is correct to say that, at its greatest, Baikal is 1640 m deep. Autumn at the Round-Baikal railroad. 336 permanent rivers and streams flow into Baikal, with half the incoming waters brought by the Selenga. Only one river flows out of the lake, the Angara. However, the question about the number of rivers flowing into the lake is rather controversial. It is more likely that there are fewer than 336. There is no doubt that Baikal is the deepest lake on Earth, its closest rival being Lake Tanganyika, a whole 200 metres behind. The lake has 30 islands, though, as has been said already, opinions on this differ. The largest of them is the Island of Olkhon. In literature, the age of the lake is usually given as 20-25 million years. In actual fact, the question of its age should be considered open, as the application of different methods of determining age give from 20-30 million to a few tens of thousands of years. It would seem that the first estimate is closer to the truth - Baikal is really a very ancient lake. If one accepts that Baikal is actually some tens of millions of years old, then it is the oldest lake on Earth. It is thought that Baikal came about as the result of tectonic forces. Tectonic processes occur to this day, as seen by the high seismic activity of the Baikal region. 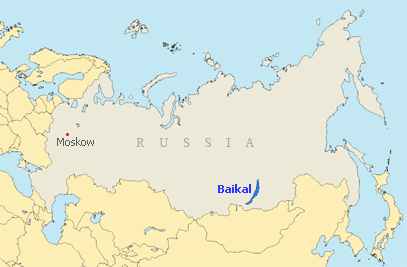 Many works of literature have been devoted to the question of the origin of the word «Baikal», indicating a lack of certainty in this regard. There are some ten possible explanations for the origin of this name. Amongst them, the most likely is thought to be the version that the lake's name comes from the Turkic language's Bai-Kul - rich lake. Of the remaining versions, perhaps two should be mentioned: from the Mongolian Baigal - rich fire and Baigal Dalai - big lake. The people living on the lake's shores named it each in their own way. For example, the Evenk called it Lamu, the Buryats - Baigal-Nuur, and even the Chinese had a name for Baikal - Beihai - Northern lake. Northern tip on the Island of Olkhon from the top of Cape Sagan-Khushun. The Evenk name Lamu, or Sea was used for a few years by the first Russian explorers in the 17th century, then they changed to the Buryat - «Baigal», and subsequently «Baikal» by means of a phonetic substitute slightly softening the letter «g». Baikal is quite often called a sea, simply out of respect, because of its turbulent spirit, or because its far shore is often hidden in mists... At the same time, a difference is made between the Maloye Morye (Small Sea) and the Bolshoye Morye (Big Sea). Maloye Morye is the part situated between the northern shore of Olkhon and the mainland, all the rest is the Bolshoye Morye. Baikal's water is unique and surprising, as is the lake itself. It is unusually transparent, pure and saturated with oxygen. In not so distant times it was considered to have curative properties, and was used as a remedy. In spring the transparency of the lake's water, as measured by a Sekki disc (a white disc, 30 cm diameter), is 40 metres (for comparison, in the Sargasso Sea, which is considered to be the standard of transparency, there is a transparency of 65 metres). Later, when a mass algal bloom occurs, the water's transparency decreases, but in still weather one can see through to the lake floor to a considerable depth from a boat. This high degree of transparency is explained largely by the fact that Baikal's water has a low mineral content and is close to distilled water, thanks to the activity of the organisms living in it. The volume of the lake's water is some 23 thousand cubic kilometres, which is 20% of the world's and 90% of Russia's freshwater resources. Each year Baikal's ecosystem produces some 60 cubic kilometres of clear, richly oxygenated water. Baikal's shore near the mouth of the river Talovka. View from Rytyi Cape towards the Shartlay Cape. View from the top of Sagan-Zaba cliff. There are more than 2600 species and varieties of animal and over 1000 species of plants in Baikal. From time to time new species are discovered. There is reason to believe that at present only some 70-80% of Baikal's living organisms are known to science. In former times, when Russian science was not yet in its present state of coma, on average some 10 species were discovered annually. About 40% of the plants and 85% of animal species inhabiting open Baikal are endemic, that is, they are found only in Baikal. Living organisms are distributed right from the surface of the lake to its very deepest parts. There are 58 species of fish in the lake. The best known being omul, white-fish, grayling, huchen (salmon trout), sturgeon, «golomyanka» - the Baikal oilfish, and «lenok», a fish of the salmon family. Some 2000 species of plant grow on Baikal's shores, and 200 species of bird nest there. A typically marine mammal, the unique Baikal seal or nerpa, is found here. It is suggested that it came here from the Arctic Ocean along the rivers Yenisei and Angara. Its present population numbers a few tens of thousands. It can bee seen quite frequently in summer in the central and northern parts of the lake.